This Action enables the automated builds of Help & Manual projects - you can build multiple output formats in one action. 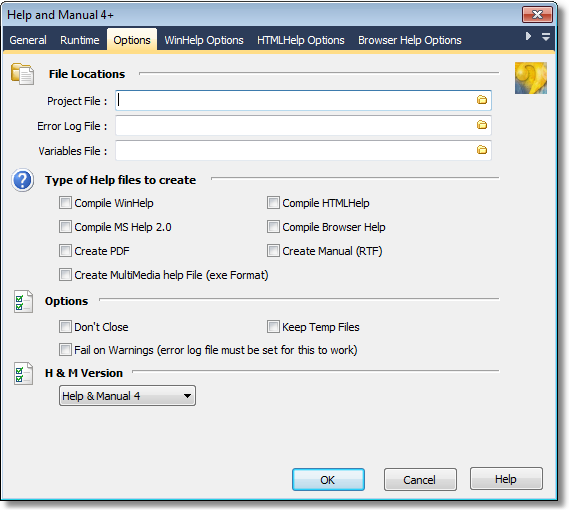 Help & Manual is a product of ECSoftware and is the tool we use and recommend for help file and manual generation. The Help & Manual project file to compile. Outputs the compile log to the specified text file. An external text file, which redefines some or all the variables in the specified project file. The file must only contain one definition per line. A list of the available project types to be built. More then one type of help file can be built. The specific options for each Help file type can be found under the relevant options tab. The Help & Manual program will be left running after the action finishes. Ensures the files generated by the 'HTML Help', 'WinHelp' and 'Visual Studio Help' help file compilers are not deleted.